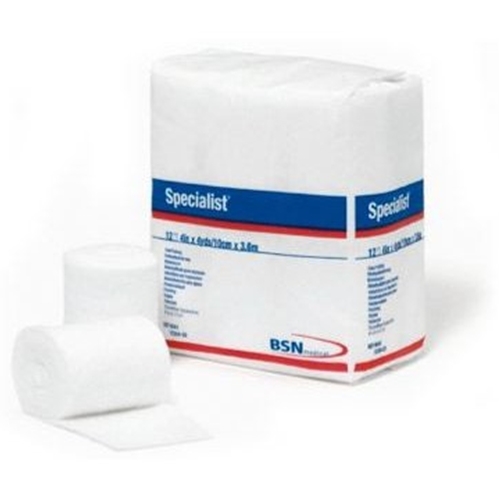 BSN Medical Specialist Cast Padding from HealthyKin.com has a unique micropleated design for excellent conformability, protection and ease of application without tucking or tearing. I was using this padding for a severe leg wound on a horse. It was used to hold a telfa pad in place. It did the job, didn't slip, and cushioned the wound site. (We did use an elastic tape as the outer layer). The horse was turned out 24/7 and very active. Great padding, I am using it to wrap a horse's leg. Excellent price and very fast delivery too! Easy to use. Did the job I expected it to do. Excellent product and easy to use. The cast padding conforms to area without any problems. Great product. It conforms to the area easily, pads area where needed without being to bundle some. I've had to change bandages for a splint on my dogs foreleg for 3 weeks. Very good padding, easy to use.